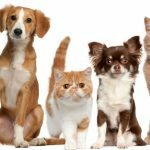 What Breed(s), age, personality and size pet is right for you and your family? You can also take the New Pet Quiz. A bad match is one of the leading causes of failed human-animal relationships, while a thoughtful match can produce a long-lasting and deeply rewarding attachment. This questionnaire will help you decide whether you can afford the time and money a pet requires—and select the pet that’s best for your lifestyle. Examine Yourself – Choosing the right dog generally means identifying the type of animal that matches your lifestyle. If you live alone in a small, third-floor apartment, for instance, adopting a large, active retriever mix might not be the best choice. Conversely, if you have a family of four and are looking for a companion to match your active lifestyle, such an animal may be perfect. A dog’s size, exercise requirements, friendliness, assertiveness, and compatibility with children should all figure into your decision. So how do you find out which dogs have the qualities you’re looking for? Information is the key: Learn about various breeds, visit with animals at the shelter, and speak with an adoption counselor for guidance. Dogs fall into one of two categories: purebreds or mixed breeds. 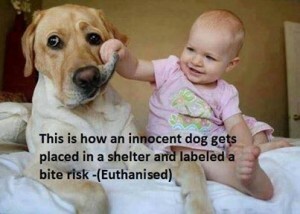 Most animal shelters have plenty of both. The only significant difference between the two is that purebreds, because their parents and other ancestors are all members of the same breed, generally conform to a specific “breed standard.” This means that if you adopt a purebred puppy, you have a good chance of knowing how big he’ll get and what general physical and behavioral characteristics he’ll have. Of course, the size, appearance, and temperament of most mixed breed dogs can be predicted as well. After all, mixed breeds are simply combinations of different breeds. So if you can recognize the ancestry of a particular mixed-breed puppy, you have a good chance of knowing how he’ll turn out, too. Mixed breeds offer several other advantages. When you adopt a mixed breed, you benefit from the combined traits of two or more breeds. You also get a dog that’s likely to be free of genetic defects common to certain purebred dogs. Mixed breeds are often considered the more “natural” dog. When you adopt a mixed breed, you adopt a totally unique companion. While you’re at the shelter, keep in mind that it is a stressful place for any animal. A kennel simply isn’t the real world. Quite often, a dog’s true colors won’t show until he’s away from other animals and the shelter environment. So even if you walk past a kennel with a dog that isn’t looking for your attention, don’t dismiss him just yet. He may just be scared or lonely. Spend some time alone with that pet – often after about 15-20 minutes you’ll see his/her true personality. You’d be surprised that shy puppy hiding in the corner may just curl up on your lap and bounce around playing with toys. An adoption counselor can help you select a dog that’ll match your lifestyle. When you spend time with each animal, you’ll want to ask yourself: How old is the dog? You may want to select a puppy as your new companion. However, young dogs usually require much more training and supervision than more mature dogs. 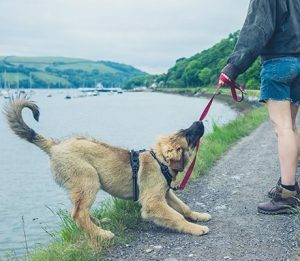 If you lack the time or patience to housetrain your pup or to correct problems like chewing and jumping, an adult dog may be a better choice. 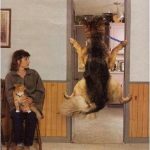 How shy or assertive is the dog? Although an active, bouncy dog might catch your eye, a more quiet or reserved dog might be easier to live with and care for. How good is the animal with children? Tips for Selecting and Introducing a new dog/puppy to children. Learning about a dog’s past from an adoption counselor can be helpful, but past information isn’t always available. In general, an active dog who likes to be touched and is not sensitive to handling and noise, is a dog who’ll probably do well in a house full of kids. Also keep in mind that puppies under six months of age, because of the demanding nature of training a pup, shouldn’t be adopted out to families who have no one home during the day…you should try to find a dog walker or consider doggie daycare. How Much Should You Feed Your Dog?The amount you feed your dog will vary greatly depending on his age, size, and activity level…. Congratulations on deciding to adopt a dog! Use the checklist to make it as easy as possible while making sure you have everything you need when you take home your new pooch! 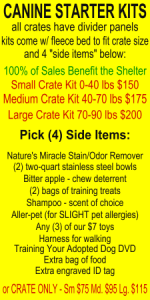 Our shelter also sells everything you need to take home your new dog/puppy – from crates – to beds – toys – food – shampoo and everything in between! 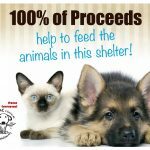 Bringing A Dog Home – Adopting a new dog? Check out these tips for welcoming your new friend. 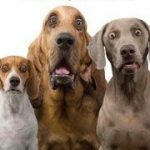 Housetraining Dogs / Puppies – Learn the keys to teaching your dog to eliminate outside and not in your home! 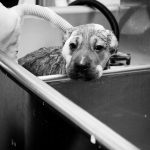 How To Give Your Dog A Bath – Bathing your dog is important for his health. Use these tips to make it as easy as possible. 10 Ways To Green Your Pet – Check out these earth-friendly steps to help reduce your pet’s carbon paw print! 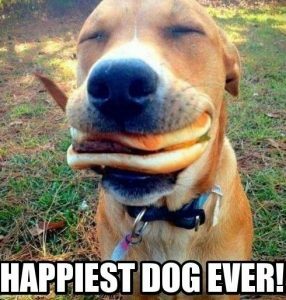 Every dog in the shelter can provide you with endless love and companionship, and every dog deserves a lifelong, loving home. But some dogs are better for you and your lifestyle than others. That’s why you should take the time to make a thoughtful choice. After all, you’re choosing your new best friend, who’ll be with you, 10, 15, or even more years. 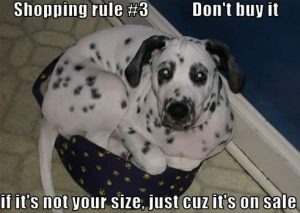 Select the right dog and you and your new companion will enjoy those years to the fullest. As you walk past a few cat cages at the shelter, you’ll notice that some cats meow for special attention, while others simply lie back and gaze at you with some apprehension. There are as many different personalities of cats as there are cats in the shelter? You need to decide which cat might be best for you and your lifestyle. At the shelter, ask an adoption counselor for assistance when you wish to spend some time with individual cats. But regardless of individual personality, look for a cat who’s playful, active, alert, and comfortable while being held and stroked. 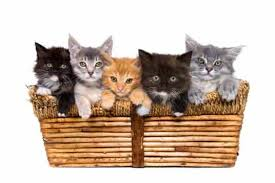 Keep in mind that, because they are in an unfamiliar environment, some cats who are usually quite social may be frightened or passive while at the shelter- these are the cats that may need extra TLC to come out of their shell-but in the end make loving pets. Kittens are curious, playful, and full of energy, while adult cats are more relaxed and less mischievous. Kittens need more time to train and feed. Cats are only kittens for a few months, so the age of the cat you adopt should really depend on the level of maturity you’re looking for. Young children usually don’t have the maturity to handle kittens responsibly, so a cat who’s at least four months old is probably the best choice for homes with kids under six years old. Cats can have long, fluffy coats or short, dense fur, and the choice between the two is primarily a matter of what you feel you can comfortably manage and what the shelter has at the time. You’ll see more shorthaired cats at the shelter since they’re the most popular and common cats. The main thing to keep in mind is that longhaired cats require frequent grooming to be mat-free. Cats with short coats also benefit from brushing, though they do not need it as frequently. Most cats enjoy a regular brushing and will look forward to this as part of a daily routine with you. Regardless of the cat you choose, you’ll want to start being a responsible pet guardian from the very beginning The easiest way to do that is to keep your cat indoors with you. There are many reasons to keep your cat/s indoors. If you don’t let your new friend outside, he’ll never miss it, and will have a much better chance of still being around to enjoy a long and healthy life with you and your family.